"No zombies, no caped crusaders or alien spacecraft." Nope, only Christoph Waltz and the limitless, twisted, beautiful, mesmerizing imagination of Terry Gilliam. We're still waiting for a trailer to debut for Terry Gilliam's The Zero Theorem, which is premiering at the Venice Film Festival in a few weeks, but in the meantime more promo material for the sci-fi film has arrived. Our friends at The Film Stage have found the full Director's Statement from Gilliam explaining why he wanted to make this, along with a new poster showing Waltz seated at his workstation. It looks about as wacky and weird as you'd expect from Gilliam, but that's exactly why I'm so intrigued. What is the Zero Theorem? Who is Qohen Leth? We'll find out soon. "When I made Brazil in 1984, I was trying to paint a picture of the world I thought we were living in then. 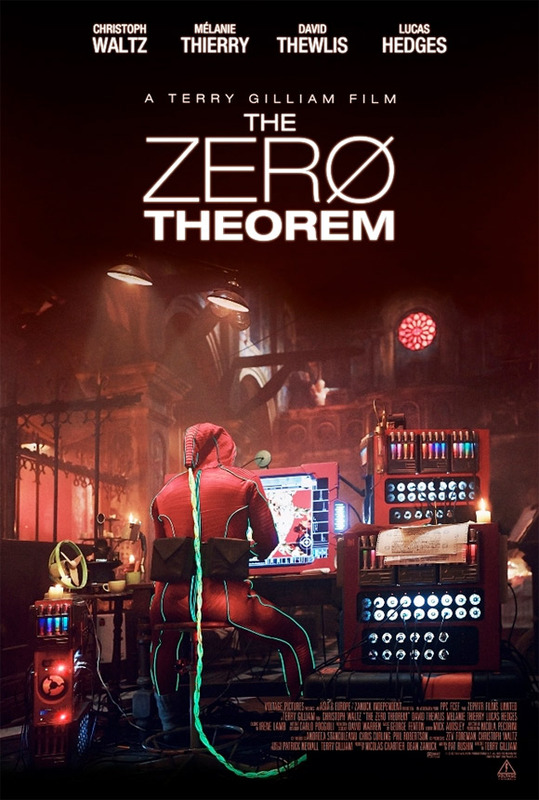 The Zero Theorem is a glimpse of the world I think we are living in now. Pat Rushin’s script intrigued me with the many existential ideas he had incorporated into his funny, philosophic, and touching tale. For example: What gives meaning to our lives, brings us happiness? Can we ever be alone in our increasingly connected and constricted world? Is that world under control or simply chaotic? We’ve tried to make a film that is honest, funny, beautiful, and surprising; a simple film about a complex modern man waiting for a call to give meaning to his life; about inescapable relationships and the longing for love, full of quirky characters and sparkling performances; raising questions without offering obvious answers. Hopefully, it’s unlike any film you have seen recently; no zombies, no caped crusaders or alien spacecraft. Actually, I might have lied about that last item. Having not worked with a budget this small for several decades, I was forced to work fast and instinctively, pressured only by time and money. We relied on the freedom to spin on a dime, to make outrageous creative leaps. The results surprised even me. I’m proud to have been part of The Zero Theorem." Terry Gilliam's The Zero Theorem, which looks a lot more like Brazil or 12 Monkeys than his recent work, stars Christoph Waltz, Mélanie Thierry, David Thewlis, Peter Stormare, Tilda Swinton, Ben Whishaw and Matt Damon as "Management." Here's the original synopsis: An eccentric and reclusive computer genius plagued with existential angst works on a mysterious project aimed at discovering the purpose of existence—or the lack thereof—once and for all. Gilliam describes Waltz as a programmer for "entity-crunching" corporation ManCom who is "waiting for a phone call that will give meaning to his life." We'll definitely be keeping an eye on this sci-fi film, as wacky and strange as it looks, stay tuned for more. Film looks great and all, but why the Ø instead of O. It just looks so distracting considering I actually have that letter in my alphabet. 🙂 It's also a mathematical symbol, I guess they mean that one..
That does make a lot more sense. Yes please! Need more Gilliam in my life! Been waiting for 4 years for this; this script is awesome, and everything I've seen of it proves to me that Gilliam's still got it. Can't wait! !